Field Quarter Program students will learn by doing research of their own at NRS reserves. A new program launching this fall will immerse students from across the UC system in the outdoor classrooms of the UC Natural Reserve System. 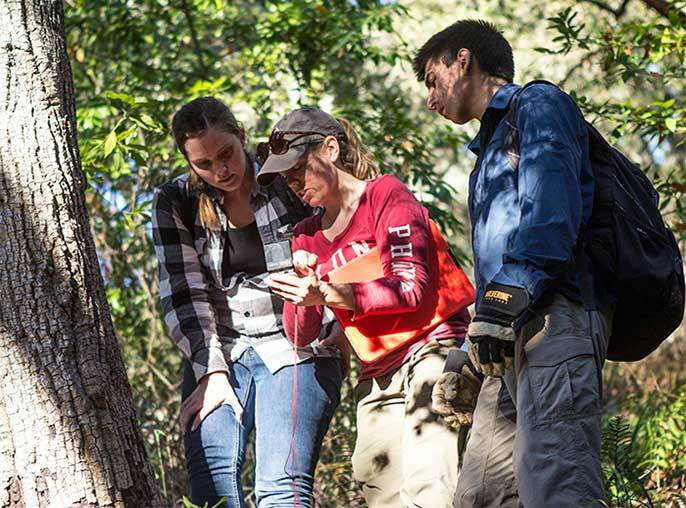 The NRS Field Quarter Program will give students opportunities to closely observe California habitats, practice hands-on field research, and gain a deeper understanding of the natural world. The NRS Field Quarter Program’s inaugural course will be California Ecology and Conservation. Composed of three undergraduates from each of the nine general UC campuses, the class will visit one NRS reserve after another over the seven weeks of the course. California Ecology and Conservation will be the only course students enroll in for the term, and yields a full complement of quarter or semester units. As they visit up to six of the 39 reserves in the NRS, students will master standard field techniques and get to know a broad range of California habitats, climate regimes, and species. The first California Ecology and Conservation class will be led by professor of ecology and evolution Don Croll of UC Santa Cruz, along with Gage Dayton, director of the UC Santa Cruz Natural Reserves. California Ecology and Conservation is based on a field course they and UCSC environmental studies professor Erika Zavaleta have taught for many years. Students cite the field class as a highlight of their undergraduate careers, and some have even published scientific papers based on course research. In California Ecology and Conservation, students will be asked to complete a study of their choosing from start to finish. Each will propose a hypothesis to explain a pattern she or he has observed in the environment, and then design an experiment to test it. Students will apply field techniques learned in the class to take measurements, and analyze these data using appropriate statistical techniques. Finally, students will report their results to the class in oral presentations and written reports. By the end of the course, students will complete up to five independent field studies, and gain the confidence and skills to conduct their own scientifically rigorous field research projects. The course is intensive and almost nonstop. Informal learning starts over breakfast, and class activities continue until lights out at night. Being engaged continuously in scientific problem-solving helps students learn in leaps and bounds. Immersion in the out-of-doors helps them grasp details about the environment impossible to acquire in a classroom. The Field Quarter Program will be administered by the systemwide office of the Natural Reserve System rather than by a UC campus. The UC Education Abroad Program will coordinate the application of tuition, financial aid, credits, and grades at each student’s home campus. Students must pass an undergraduate ecology or biology course to be eligible. A course fee of approximately $3,500 applies to cover lodging, food, and transportation, and this fee may be offset by financial aid. Field Quarter Program credits apply toward graduation requirements at the discretion of each academic department. Current department-specific credit allocations for California Ecology and Conservation can be found here. Students may decide to contact an academic adviser to discuss course credit mapping. Two additional Field Quarter Program classes are planned for the future: graduate student training workshops in the natural sciences will provide intensive, hands-on practice in field techniques at different NRS reserves; and The Art of Seeing will bring fine artists and natural scientists together to help undergraduates observe the environment through different eyes. Applications for California Ecology and Conservation will be available starting Dec. 1, 2014. All applications and supporting information must be received by Feb. 2, 2015. Course instruction will begin Sept. 24, 2015.For more information, contact NRS Program Coordinator Erin Marnocha.